What Does Marxist-Humanism Mean for Today? As the global crisis of capitalism deepens, so too does the search for alternatives to it. This brings to life the contributions of Raya Dunayevskaya, an uncompromising critique of capitalism in both its “free market” and statist forms. 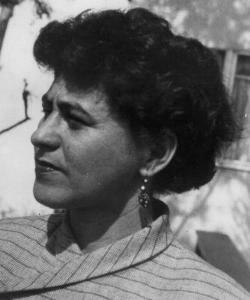 Born in Ukraine in 1910, she was Leon Trotsky’s Russian-language secretary during his exile in Mexico. After breaking from him, she developed the analysis of the USSR as a “state-capitalist” society, published the first English translation of parts of Marx’s Economic and Philosophic Manuscripts of 1844, and from the 1950s through the 1980s developed the philosophy of Marxist-Humanism in a number of path breaking works. Join us for a discussion of how her ideas speak to issues now being debated by feminists, critical race theorists, and many others searching for new pathways to liberation. With a cry of joyous rage and a little dance I announce that Crack Capitalism (published by Pluto Press, London, distributed by Palgrave in the US) is now in the shops. Rush out immediately to get your copy, give one as a present to all your friends (at least one each), put it on every reading list you can think of, order it for libraries, write reviews for newspapers and journals, spray-paint it as a slogan on the walls of the city, shout it from the rooftops and send this on to all your contacts. And if you want to send me comments, I would be delighted. Crack Capitalism, argues that radical change can only come about through the creation, expansion and multiplication of ‘cracks’ in the capitalist system. These cracks are ordinary moments or spaces of rebellion in which we assert a different type of doing. John Holloway’s previous book, Change the World Without Taking Power, sparked a world-wide debate among activists and scholars about the most effective methods of going beyond capitalism. Now Holloway rejects the idea of a disconnected array of struggles and finds a unifying contradiction – the opposition between the capitalist labour we undertake in our jobs and the drive towards doing what we consider necessary or desirable. Clearly and accessibly presented in the form of 33 theses, Crack Capitalism is set to reopen the debate among radical scholars and activists seeking to break capitalism now. Anarchist movements have a long history of resisting traditional schooling and authoritative pedagogical practices, while at the same time, attempting to construct transformative educative processes. Examples include Francisco Ferrer’s (1913) work entitled, Origins of the Modern School and the creation of the Escuela Moderna schools in Spain, the Modernist Schools in the United States (Emma Goldman, Voltaraine de Cleyre, Alex Berkman and others) during the early 20th century as well as contemporary anarchists who are experimenting in participatory informal learning spaces. These examples are important to acknowledge within radical notions of teaching and learning being that they are experiences that enable activists and scholars to critically re-imagine education and build theories on “how” and “where” individuals experiment in constructing knowledge through differing learning spaces (Coté, Day & Peuter, 2007; de Leon, 2008, Malott, forthcoming). Moreover, as totalizing efforts of the nation-state continue to develop standardized curriculum, efficiency models and data driven outcomes, anarchist pedagogies attempt to construct ongoing collective learning environments that can be described as ‘disciplined improvisation’ or ‘spontaneous’ in nature (Goldman, 1969; Haworth, forthcoming; Sawyer, 2003; Ward, 1972). Furthermore, these informal learning spaces create new ways of exposing illegitimate corporate and state power, as well as participating in the ‘coming communities’ (Day, 2007). This edited book calls on international scholars (15 single authored or collectively authored chapters) in anarchist studies to critically reflect on historical and contemporary experimentations in anarchist pedagogies. Scholarly efforts will focus on what we have learned from past anarchist experiences and current transformative learning environments — where individuals are engaged in collective, participatory, voluntary and mutual efforts that contest global capitalist structures. The edited collection responds to the need to reflect on anarchist pedagogies and will highlight three major themes. Authors in the first section will be encouraged to focus on historical discussions surrounding anarchism and education. The authors will give introspective critiques of historical practices, including theories of teaching and learning and alternatives to compulsory public schools. Authors in the second section will construct philosophical and theoretical frameworks evolving from contemporary anarchists, particularly through individuals participating in cooperatives, independent media collectives, infoshops, political zines, open source projects, DIY, direct action networks and other autonomous and cultural spaces. Continued efforts to construct theoretical and philosophical discussions surrounding anarchism have also provided opportunities to build affinities and tensions with frameworks outside of anarchist writings (Cohn, 2007). The third section will encompass anarchist theories of teaching and learning. Authors will be asked to construct linkages and apprehensions to theories surrounding critical pedagogies and critical theory, autonomous Marxism, postmodernity and poststruturalism. f. What have we learned? Anarchist Pedagogies will draw upon and make connection to contemporary anarchist studies literature, particularly in education. The book will be important for scholars in anarchist studies, critical pedagogy, as well as undergraduate students and activists who are interested in building philosophical, theoretical, historical and contemporary discussions and imaginations beyond traditional forms of education. Editor will produce a comprehensive introductory and single authored chapter in one of the three sections. The forward will be written by an activist/scholar. Final editing and approval of the formatted version will be submitted December 30th, 2010. Publishing date will be set for early fall, 2011. Robert Haworth is an Associate Professor in Multicultural Education at University of Wisconsin-La Crosse. He currently serves as the director for the Research Center for Cultural Diversity and Community Renewal. He teaches undergraduate and graduate courses surrounding diversity and education, globalization and neoliberalism. He has published multiple peer reviewed book chapters and presented internationally on anarchism and informal learning spaces, as well as critical social studies education. He co-founded Regeneration TV, along with other research collectives that are directly involved in contesting neoliberal policies at the university level. This is Robert Haworth’s first edited book. Peace Education is currently a burgeoning field of scholarship and research that continually experiences challenges to its legitimation and participation in more traditional and conventional approaches to education. Today, it receives increasing recognition by educators and the public in response to growing societal interests in globalization and local forms of school violence. “Peace” is a guiding concept and principle that motivates current educational movements to redirect cultures of war into cultures of peace and transform their school cultures into constructive learning communities. Peace education has worked in repairing the physical, psychological, and social fabric of human lives and societies impacted by natural disasters, war, violence, and human struggle throughout highly developed and underdeveloped countries. It addresses all life stages of human development and growth that lead to sustainable peace education practices within formal institutional and informal settings. This special edition will examine the field of peace education, its past, present, and projected future. This call for papers invites submissions that take an overview of the field of peace education, its emergence and gradual formation from the past, the current state of the field and possible visions for the future. It encourages submissions that utilize multidisciplinary, interdisciplinary, and transdisciplinary methodological approaches to study and research. It accepts works that examines the conceptual foundations of peace education and accounts for the relationship of theory to practice/praxis within a variety of traditional, modern, and post-modern philosophical frameworks. It seeks papers that review historical trends and/or analyze specified areas of peace education, e.g. environmental ecology, varieties of conflict resolution and mediation, non-traditional school practices, philosophical concepts, historical and current figures, educational movements, multicultural communities, local to global transitions, national/internatio nal and comparative education, educational programs in various regions around the world, impact and effectiveness of NGO activities and global institutions, indigenous education, etc. Importantly, it looks for overviews and discussions in peace education about context based schooling practices – curriculum, discipline, classroom management, assessment & evaluation, educational policy and accounts regarding any members involved in schooling. Importantly, it seeks works that venture to understand how peace education might be distinguished as a field of scholarship and research from other educational traditions. Please contact Jeannie Lum (jlum@hawaii. edu), if you have inquiries regarding your topic prior to submitting your proposal. May 17, 2010 — The political crisis engulfing Thailand is not a clap of thunder in an otherwise calm sky. The discourse about a country where “everyone lives in harmony and where there is no class struggle but a people united behind its adored sovereign” has nothing to do with reality. For several decades, the Thai people have been subjected to authoritarian regimes or dictatorships and a king in their service. The Thai élites have however not succeeded in preventing regular uprisings against the established order, including those in 1973, 1976 and 1992, all repressed by bloodbaths. May 21, 2010 — At 11.59pm on May 19, 2010, the 1,000,000th article was read at Links International Journal of Socialist (since records began being kept on April 4, 2008). The article was accessed somebody in Toronto, Canada — the 744,733rd visit to Links — who entered site at the fascinating speech by veteran South African revolutionary socialist Neville Alexander. On May 21, at 5.50pm, Links International Journal of Socialsit Renewal received its 750,000th visitor, who was from Thailand and who read one of Giles Ji Ungpakorn’s essential articles on the struggle for democracy in that country. Neville Alexander: South Africa – An unfinished revolution? May 24, 2010 — Even as the Australian federal Labor government sticks its Carbon Pollution Reduction Scheme [carbon trading scheme] into the freezer the climate change crisis intensifies, demanding a response adequate to its enormity. The goal dictated by climate science is annual emissions reductions of 5% from now to 2020 — the critical “transition decade”. Olivier Besancenot: `We are all Greek workers! May 14, 2010 — Le Monde via The Bullet — The events in Greece concern us all. The Greek people are paying for a crisis and a debt not of their making. Today it is the Greeks, tomorrow it will be others, for the same causes will produce the same effects if we allow it. With some great revolutionary figures in world history, and in international labour history in particular, it has been found necessary for historians or biographers to dig out their subjects from beneath “a load of calumny and oblivion”, “a mountain of dead dogs”. With others, however, a different problem exists. Lenin pointed to this when he wrote that the ruling classes, following upon the deaths of great revolutionaries, often attempt — after having met the ideas and actions of such men and women during their lifetimes with “furious hatred … and slanders” — to turn them into “harmless saints … by way of `consolation’ to the oppressed … while at the same time emasculating and vulgarising the real essence of their revolutionary theories and blunting their revolutionary edge”. May 17, 2010 – The May 10, 2010, election has been bandied about as the cleanest and the most peaceful since the restoration of this exercise after the fall of the Marcos dictatorship in 1986. This is attributed to the computerised election which ensured the quick counting of votes so that there would not be sufficient time for any of the trapo (traditional politician) to cheat. Democracy Now! debate: Is Thailand’s Red Shirt movement a genuine grassroots struggle? May 18, 2010 — In Thailand, the government has rejected an offer by anti-government protesters to enter talks after a bloody week in Bangkok that has left at least thirty-eight protesters dead. Some fear the standoff could lead to an undeclared civil war. The protesters are mostly rural and urban poor who are part of a group called the UDD, the United Front for Democracy Against Dictatorship, more commonly known as the Red Shirts. We host a debate between Giles Ji Ungpakorn, a Thai dissident living in exile in Britain who supports the Red Shirt movement; and Philip Cunningham, a freelance journalist who has covered Asia for over twenty years. May 16, 2010 — When the White House is quiet as protesters are butchered in the streets of Bangkok, suspicions are raised. Silence often equals complicity. One can only imagine what the US government’s response would be to a Venezuelan government slaughter: the US media and US President Barack Obama would loudly condemn such an act, in contrast to the muted response to Thailand’s bloodbath. May 15, 2010 — The tremendous success of the April 19-22 World People’s Summit on Climate Change and Mother Earth Rights held in Cochabamba, Bolivia, has confirmed the well-deserved role of its initiator — Bolivia’s President Evo Morales — as one of the world’s leading environmental advocates. Statements by the New Anti-Capitalist Party of France, Socialist Alliance of Australia, the Socialist Party of Malaysia, the Fourth International, Focus on Global South, Australia Asia Worker Links. See also Asia-Pacific left statement — `Resolve crisis through democracy, not crackdown!’, by Asian left and progressive organisations. May 2010 — With the help of Socialist Alliance members in the growing Sudanese community in Australia, Green Left Weekly — Australia’s leading socialist newspaper — publishes a regular Arabic language supplement. The Flame covers news from the Arabic-speaking world as well as news and issues from within Australia. Editor-in-chief is Soubhi Iskander is a comrade who has endured years of imprisonment and torture at the hands of the repressive government in Sudan. 10:40-12pm: Session 3 (concurrent): Do Social Forums Challenge or Reproduce Social Inequalities by Race, Nativity, and Nation? 1:10-2:30pm: Session 4 (concurrent): Who Participates and for What? This conference is co-sponsored by the Center for Peace and Conflict at Wayne State University, the Political Economy of World-Systems section of the American Sociological Association, the journal Critical Sociology, the Program on Global Studies at the University of California-Riverside, the Institute for Research on World-Systems at the University of California-Riverside, the Global Studies Association, the World Society Foundation and Sociologists Without Borders. The event will explore themes from the widely read RMF report ‘Eurozone in Crisis: Beggar Thyself and Thy Neighbour’. It will also contribute to the debate on the social, political and economic aspects of the Eurozone crisis that was launched by the Birkbeck Institute for the Humanities. Since the start of 2010 the Eurozone crisis has become progressively deeper, threatening the existence of the euro as well as the coherence of the European Union. The crisis poses questions of economic malfunctioning and austerity policies imposed on several European countries, but also of democracy and state relations within the European Union. The roundtable will consider these issues from a variety of radical perspectives. CHAIR: Larry Elliott, The Guardian Newspaper. From biblical apocalypse to the nihilism of the late nineteenth century, from the Enlightenment invention of progress to the counter-cultures of the late twentieth century, from technological utopianism to contemporary anticipations of environmental catastrophe, western civilization has been consistently transfixed by the figurative potential of the future. ‘No Future’ seeks to connect and inter-animate these disparate ways of thinking about the future, while at the same time questioning the basis of the various discourses of futurity they have produced, and which have proliferated in recent years. ‘No Future’ thus also implicitly questions what it is – other than the preoccupations of the present – that is invoked when we talk about the future. The conference aims to stage a series of inter-disciplinary encounters around these different senses of ‘No Future’, and to examine the value and implications of adopting a ‘futurist’ position across and between a range of disciplines in the Humanities and Social Sciences. Contributions may take retrospective form, re-assessing significant moments in past discourses of futurity such as apocalypticism, Enlightenment ideas of progress, the persistence of the apparent dialectical unity of utopia/dystopia, the constructions of Modernism and the Historical Avantgarde, the symbolic projections of psychoanalytic theory. Others might examine the disciplinary shifts that have displaced or dispersed avantgardism in postmodernity, opening out onto such themes as transhumanism, post-postmodern reinflections of the dialectic, and various forms of contemporary utopianism. All of these are related to the central question of the ideological and aesthetic implications of any appeal to futurity, at the heart of which lies the tension between the future as rhetorical evasion and the future as the most persistent and deeply embedded of all heuristic devices. Proposals for individual papers or integrated panels that engage with any aspect of the central theme are invited. Papers should be of 20 minutes duration to allow adequate time for discussion, and proposals for integrated panels should comprise a chair and three speakers. Proposals should be no longer than 250 words and should be submitted as an attachment to: alastair.renfrew@durham.ac.uk by Friday 2nd July 2010. 1] A one day workshop centred around a debate between DOREEN MASSEY and DAVID HARVEY, Friday 19th November, organised by Chantal Mouffe (node Director at the Centre for the Study of Democracy, Westminster). (further details forthcoming). 2] ANANYA ROY ON POVERTY, DEMOCRACY AND PUBLIC SCHOLARSHIP: A micro-seminar on the research and activism of ANANYA ROY (organised by Katharyne Mitchell, node Director, University of Washington) and Victoria Lawson at University of Washington). This includes a public lecture by Ananya Roy: Monday, Oct 11, 6:00pm, Kane Hall; a preliminary seminar on Friday, Oct 8, 2:30 – 5:20pm, CMU 202 and a concluding seminar on Tuesday, Oct 12, 3:30 – 5:20pm, CMU 202 where there will be a discussion of intersections between public lecture, Roy’s publications and her public activism and scholarship. 3] A FILM is being made on NEOLIBERALISING INDIAN CITIES with Director of the South Asia Node of the Spaces of Democracy and the Democracy of Space network, Swapna Banerjee-Guha, from the School of Social Sciences, TISS, India. (further details forthcoming). 4] The book WHAT IS RADICAL POLITICS TODAY? (2009) Palgrave-MacMillan, edited by Jonathan Pugh, Newcastle University, is now available for £10 at some bookstores. A crisis makes you re-think your life. The recent economic crisis is no exception. All of us are now thinking how the world could be run differently. Despite this, a radical alternative has hardly emerged to mobilise the masses, which begs the question: What is radical politics today? In this book, leading academics, politicians, journalists and activists attempt to pinpoint an answer, debating the issues facing radical politics in the 21st Century. Rarely united in their opinions, they collectively interogate the character and spirit of being radical in our times. * Explores the spirit and character of radical politics, at this pivotal moment in history. * Thirty well known and influential commentators write original 3000 word essays. * Offers thought provoking and often conflicting opinions. * The only current wide ranging survey of the state of radical politics, post-crisis. * Accessibly written for the general public and student audiences. “Jonathan Pugh gathers some of the most innovative and insightful voices from Britain and beyond to stage a series of debates on the central issues facing radical politics today. This collection is a model for the kinds of discussion we need to move forward.” Michael Hardt (Duke University). “This is a bold, brave and timely book. As we emerge, blinking into the light after three decades of neo-liberal darkness, Jonathan Pugh has put together a collection of essays that will provoke and provide clues to the question of what comes next; what indeed is radical politics today?” Neal Lawson (Director, Compass). Cold Hands & Quarter Moon entered two new tracks on their MySpace site today.